Corporate Knights has historically used the World Economic Forum annual meeting in Davos to draw attention to their Global 100. For the first time, CDP (formerly Carbon Disclosure Project) announced their “A-List” during the week of WEF’s annual meeting, as well. Cisco’s most material environmental sustainability issue is energy and greenhouse gas emissions. As such, for more than 10 years, we’ve invested in energy efficiency and reducing our greenhouse gas (GHG) emissions. We use CDP’s annual Carbon questionnaire as a litmus test to measure our strategy, initiatives, and performance. 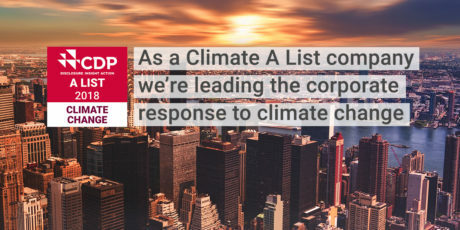 For 2018, Cisco again made CDP’s “A-List,” along with 125 other companies out of almost 7,000 that reported carbon data. Cisco has reported to CDP every year of its existence, receiving more awards from CDP for our climate change submittals than any other company. We’ve included a table in our 2018 CSR Report (p. 124) summarizing our results. In 2018, we began our third, 5-year Scope 1 and 2 GHG emissions reduction goal, targeting a 60% absolute reduction in our operations worldwide by FY22 (FY07 baseline). We continue to invest in low-carbon electricity with a goal of 85% renewables by FY22. We’ve been over 80% renewables the last two years. It’s difficult for us to go much higher, as renewables aren’t yet available everywhere in the world that Cisco has owned or leased operations. In 2018, we released a product-related goal to improve large rack-mounted-equipment system power efficiency—as measured from the input power from the facility to the board-mounted ASICs, memory, and other chip devices—from 77 percent to 87 percent by FY22 (FY16 baseline). We’re closing in on our supply chain goal to avoid 1 million metric tonne of GHG emissions from 2012 to 2020. In addition, at least 85% of our manufacturing, component, transport, and recycling vendors—as measured by spend—now report to CDP. Corporate Knights gathers a targeted set of environment, employee, innovation, supply chain, and financial data from several sources and weights the data according to industry standards. This year, Cisco made the Top 20 of the Global 100 for the third year in a row, out of approximately 7,500 companies analyzed by Corporate Knights. The Global 100 methodology is interesting, and its results present a very diverse set of top-performing companies, providing an opportunity to learn best practices from a wide range of companies and industries. In the Communications Equipment industry classification, so-called “green revenue” counts for 50% of the overall score, reflecting the value companies can contribute through the products and services they sell. Our products and solutions can help our customers be more sustainable and reduce operations expenses through building energy management, remote collaboration to reduce business travel, teleworking to reduce commuting (and office footprint), data center equipment that enables energy-efficient cloud services, and IoT and low-power network technologies for improved asset tracking and management. Cisco relies primarily on four rankings/ratings to measure our progress on sustainability: (1) DJSI (Dow Jones Sustainability Indices, specifically the World and North American indices), (2) FTSE4Good, (3) CDP Climate, and (4) Corporate Knights Global 100. These rankings are a valuable resource to confirm our strengths and improve weaknesses in our sustainability practices. We think focus on a few key benchmarks has played an important role in becoming a global sustainability leader.